No matter what your home's outdoor setting is, wicker patio furniture can enhance the overall comfort of your landscape. The beautiful, timeless, and extremely durable material made of reed and cane can give you, your family and your friends a comfortable place to relax and enjoy the outdoors. And because wicker is such a flexible material, manufacturers have twisted and wrapped the material into several elaborate designs that serve several different purposes. Not to mention, wicker is extremely light making it easy to move when cleaning your patio or moving furniture to entertain guests. Wicker is the perfect outdoor furniture material. Here are some of the top wicker furniture designs and pieces that you can add to your patio. The wicker swing is one of the oldest designs of wicker furniture. Getting its debut in Egypt, the wicker swing can be hung from the ceiling of your patio. Swing’s do great being hung in corner congregating areas. There are several designs of wicker swings such as single person swings and multiple person loveseats. Some of the more popular style of wicker swings includes hanging papasan chairs that will be all the envy of your patio. For centuries, outdoor swings have been on patios helping to reinforce the memories and experiences of thousands of people. Does your backyard have a pool? An elegant way to enjoy sitting out by your pool is an outdoor wicker bed. 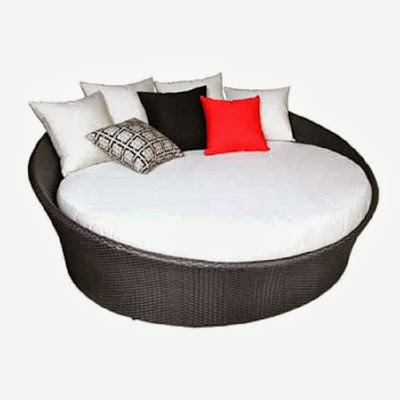 Wicker beds usually lie low to the ground and have an adjustable back much like outdoor plastic strap lounge chairs. Wicker however, is much more comfortable than plastic straps, and is just as durable. There are even larger size wicker beds available on the market for two people. Some wicker beds come as large as queen and king size to make for a romantic outdoor escape. For the main congregation area of your patio, matching rockers and a sofa can make for a great socializing area. Wicker patio can come in many different colours and materials including rattan, cane, kubu, bamboo, willow, seagrass, and banana leaf to name a few. Each material has its own characteristics and colour that can be used to create any feel in any setting. Add some beautiful matching cushions and your patio can be transformed. When selecting your next outdoor patio set, patio furniture designed and manufactured with wicker should be at the top of your list.